Starting an online clothing store of any type begins with creating a concept. You have many options to market and design your site, but you must certainly have a strong web design and presence of products that give reasons why people should buy clothes from you. The rewards of having excellent content and design will prove worth the time and energy invested. On a piece of paper, make an outline of your site. Sketch a design of how would you like your site to look like. 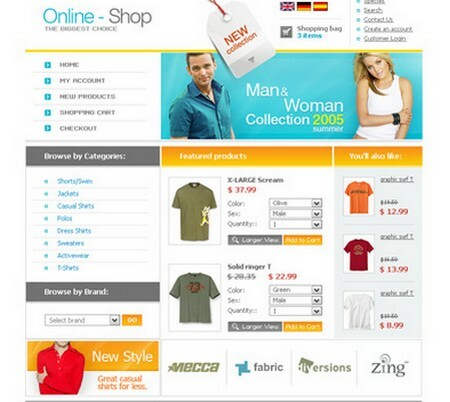 Consider visiting other online clothing stores for ideas. Most will have photos of the products on their homepage with their prices and brief descriptions. Organize what you plan to sell. If you have a target market such as women’s wear, provide as many descriptions as possible. Identifying your target market can help you focus on your demographics, but offering customers more options such as men’s wear, the latest fashion trends and specialty items will provide more profit. Manage your site visually. Choose a design that allows visitors to easily find your products and the information for which they look. Hire a professional web designer and have him create your design of choice. Find a web hosting service. Having the right web hosting company will increase the chances of success of your online store. Search for a web host that offers free help with technical details such as what platform to use, how to take payments and more. Design your home page. Place the best buyers or new deals at the top of the page. Product placement counts. Give the customers an instant picture of your business and your products. Categorize the items in a logical way, whether according to clothing type, clothing designer, sizes, clearance items, etc. Stay true to the theme of your store and keep the site easy to navigate. Add personality to the site by bringing in a color scheme. Place appropriate graphics of your choice. Just remember you’re trying to sell, so make sure your products don’t get lost in the website’s design. Launch your website when ready. Spread the word about it through message boards, social media sites, online directories, e-mail marketing, and just about any way else you can. Sign up for free Google Analytics to know how many visitors you have for your site. Make sure your visitors can reach you. Include your phone number, email address and a live customer service support chat link to the site. Keep your online clothing store fresh. Update your customers with the newest fashion trends. Include articles about the latest fashion new if you want. Providing articles can make a visitor want to stay longer on your website and add in more traffic.